Quotes to Live By 4 days ago â€œNo oneâ€™s coming to help you make your dreams come true, thatâ€™s up to you.â€� â€“ Kevin Smith So in other wordsâ€¦get to work! 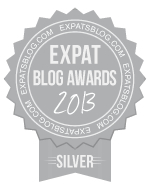 ExpatsBlog.com Expat Blog Awards 2013: Switzerland Silver Award! This blog won the Silver Award for best expat blog in Switzerland!